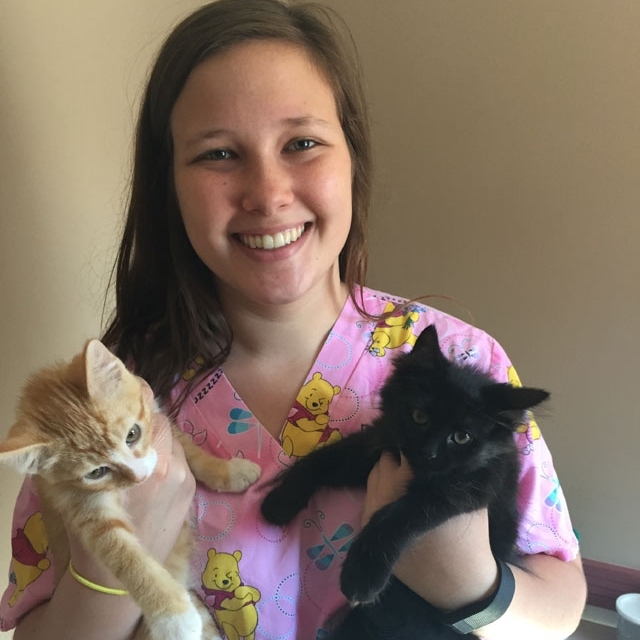 The Hinsdale Humane Society offers two internship programs for those interested in working with animals and/or those interested in a veterinary medicine career, and one internship for those looking to intern in the areas of Marketing and Special Events. Find details below. Interns work 40 hours a week, including weekends, for 3 months. Upon completion of the internship, $1,500 is awarded. For more information or to apply, please contact the shelter at (630) 323-5637 or info@hinsdalehumanesociety.org. Alongside staff at the West Suburban Veterinary Associates to gain valuable, hands-on experience with advanced medical equipment, such as digital radiography, ultra-sound, laser, digital dental radiography, and laparoscope. One day a week at Hinsdale Humane Society to learn breed identification, behavior counseling, animal handling skills, temperament assessment, and customer service skills. This paid externship lasts six weeks. Upon completion of the externship, $1000 is awarded. For more information or to apply, please contact Janet Storjohann at West Suburban Veterinary Associates at 630-968-4212 or jstorjohann@westsuburbanvet.com. Summer. Approximately 3 months, 20 hours per week. A few potential evenings and weekends required. For students who have completed sophomore or junior year of college. The Internship will offer experience in marketing, graphic design, communications, special events planning, media relations and fundraising. The Intern will work with staff and volunteers on exciting, high profile events and projects, and will learn about the inner workings of our non-profit animal welfare organization. If applicable, credit hours will be allocated according to your University standards. Upon completion of the internship, a $1,000 scholarship is awarded. Proficiency in Google Docs, Slides and Sheets, and Adobe products: InDesign, Illustrator, etc. To apply, please submit resume and letter of introduction to pr@hinsdalehumanesociety.org. Application deadline is April 1, 2019.